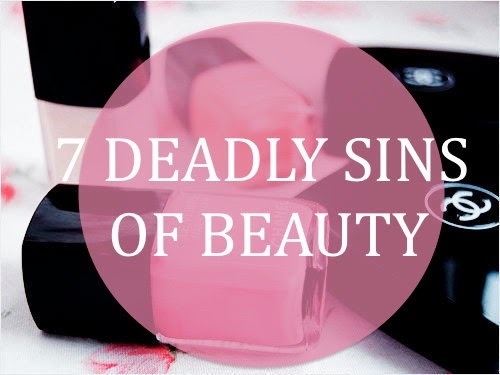 Seven Deadly Sins of Beauty | RAWR BOWS. Hello everybody! A few days ago, the lovely Katy from what Katy did (you should definitely check out her blog) tagged me to do this tag and I thought I would give it a go! GREED - what is your most expensive beauty product? What's your most inexpensive? My most expensive beauty product is probably my MAC lipstick. I think it's about £15 so it's not even that expensive but I don't really like spending a lot on make up as I feel bad afterwards so I don't have many expensive things. My most inexpensive beauty product has to be my Essence blush that I got for probably around 1€, which is quite cheap for such a gorgeous blush. WRATH - what beauty products do you have a love / hate relationship with? BB creams, I like them because they feel light and moisturise my skin but I feel like they don't give me enough coverage but I wish they did! So, basically, I love them because they feel nice, if only they were like foundations! GLUTTONY - what product do you have the most of in your beauty collection? Do nail polishes count as a beauty product? if they do then, nail polishes, I must have around 20, I don't really know. If they don't, then I would have to say... I don't really have many products, probably lipsticks? or eyeshadows? I don't know to be honest, I have like 5 lipsticks and 7 eyeshadows which is not a lot but oh well! SLOTH - what beauty product do you neglect due to laziness? Eyeliner. It's not even that hard and it only takes me about a minute but when it's 8am and all I want is to go back to bed I really can't be bothered to try and 'draw' a straight line. PRIDE - what beauty product gives you the most confidence? Foundation, I feel like after you've applied some your face literally gets 100 times better! Also, I think mascara makes a huge difference! It makes your eyes pop and look more awake. LUST - what's top of your wishlist? ENVY - which beauty blogger are you most jealous of? I love Zoella, she's also a youtuber (if you know her you'll probably do because of her youtube channel and not because of her blog). I just think she's so cute and fun, and hyper sometimes as well! Also, it's impressive how far she's made it just talking to a camera. I really admire her! Well, and that's it! I tag you all and let me know if you decide to do it! Great post! I may give the tag a go!